This song is not at all what I expected when I went looking for "Rekha + Dharmendra," but oh boy am I glad I found it! I hope they - and the camera crew - took their Dramamine. I'm tempted to put forward the theory that an actor in the late 60s, 70s, or early 80s isn't really a star until s/he has been filmed at that swimming pool. Thanks to Bollywood Deewaana, who has a fine collection of Rekha posts on his site at all times, for posting this. 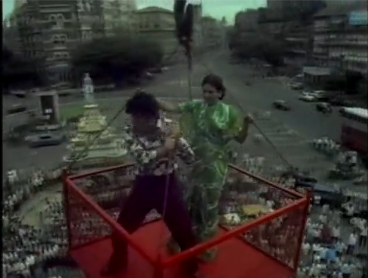 Another song from this film in the same general vein of "Dharmendra horsing around while his heroine protests very mildly" is "Duniya Mujhse Kehti Hai," but it might be notable only for the set designer's use of crepe paper. The danger of following youtube links is that you stray from your original search because you notice things like a clip from the film Ghazab labeled "Dharmendra annoyed with Ranjit" with Dharmendra doing his word-chewing growly thing at the end. Or you decide to keep looking, hoping for something wackier, and find Rekha looking stunning and sunny - and holding a bunny - while Dharmendra sports fake teeth. Or perhaps you like your stars younger and more under the influence? This movie looks fabulous, no? Wah! With careers in such juicy decades, I wouldn't doubt there are more wonderful Rekha + Dharmendra clips out there. If you have any favorites, send them my way! Sharmi - She really does, doesn't she? As I've been digging around youtube I have found things that I can hardly recognize her in.